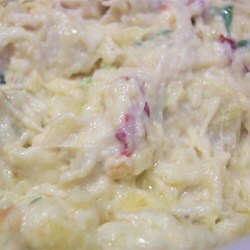 This dip fancies up the traditional artichoke dip with the addition of sun-dried tomatoes. Serve with sliced baguettes or crackers and impress your guests with your culinary flair! Preheat oven to 350 degrees F (175 degrees C). Lightly grease an 8×8-inch baking dish.